Presenting Angel and Storm Comiquettes from Sideshow Collectibles! Growing up in the Philippines, you get exposed to a lot of religious iconography: Saints, Jesus Christ, Crucifixes, the Virgin Mary, little cherubims, and a lot of angels. 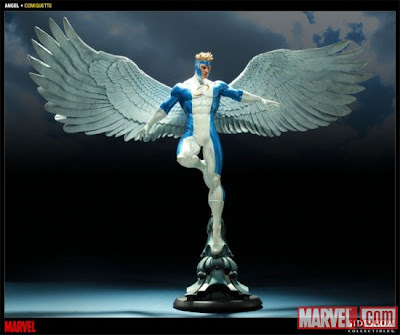 So while trawling through the Marvel.com website I confess that I had to stop and wonder what my sacred ancestors would think, say and do if they saw this hanging around a living room. Personally, I would expect the same reaction that I'd probably get from them watching Madonna gyrating to "Like a Prayer" while crucifixes burned behind her. This is the most modern release of Sergeant Kup since his original release in 1986. 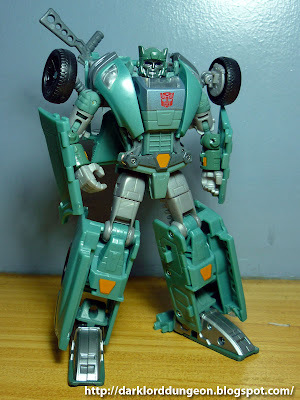 While he is definitely a much more traditional representation than his 2009 Botcon box-set release (Where he was a repainted version of Transformers Cybertron Red Alert), purists of Sergeant Kup may end up disappointed in the fact that Sergeant Kup is not as true to his original look despite being in Transformers Generations - a line that has been trying to give a modern but relatively true to original re-boot to the old Transformers toys - with a few exceptions (I suppose this is one of them). 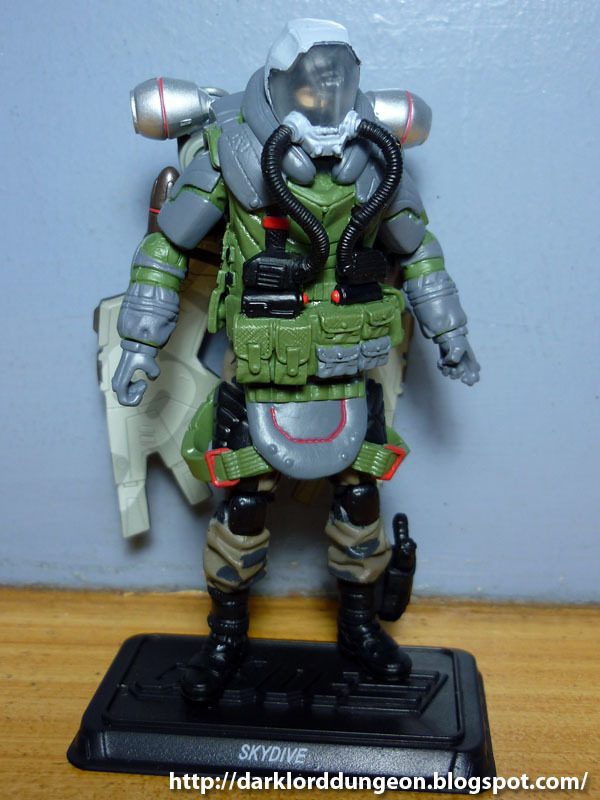 Conversely, some people will grow to appreciate this upgraded/modern look provided by Transformers Generations for Sergeant Kup. G.I. Joe Pursuit of Cobra Duke (Wave 1) A.K.A. Duke: Team Commander. This is easily one of the best G.I. Joes that you could invest in. G.I. Joe Pursuit of Cobra Duke's detail is simply exquisite, he has a wonderful complement of weapons and accessories - that he can actually all carry at the same time (in fact the amount of equipment G.I. Joe Pursuit of Cobra Duke is carrying is reminiscent of how much gear trained U.S. Army Rangers carry - I obviously watch too much Discovery Channel). G.I. Joe Pursuit of Cobra Duke is a perfect look into what G.I. Joe would look like in the real world. In fact it almost has an "anti-G.I. Joe" feel about it. Personally the only thing I would change is the fact that G.I. Joe Pursuit of Cobra Duke's blonde hair still stands as clean. It's like a lightbulb calling in the dark. A removable poncho would have also been a nice add-on and a leg holster for his pistol. Transformers: Jet Magna Convoy - A word. We got a question in our facebook page regarding Jet Magna Convoy's.... rear. 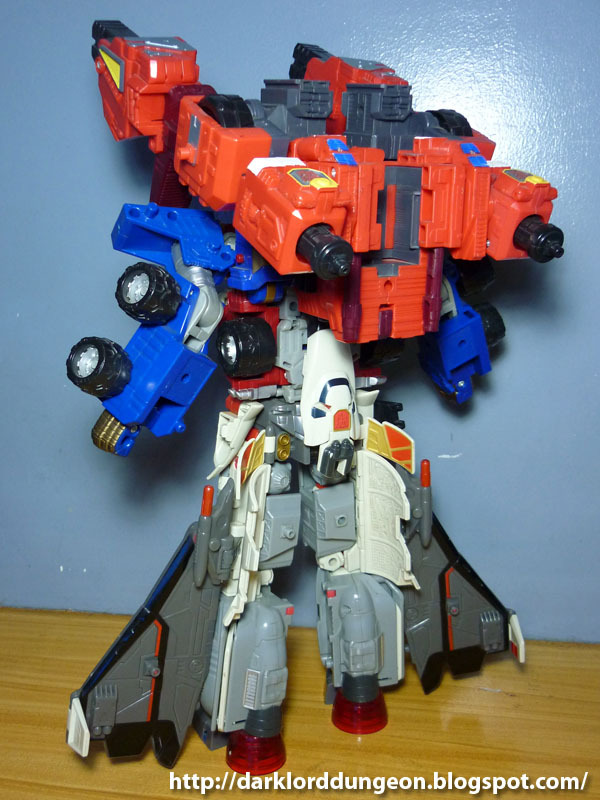 To be perfectly honest, despite the fact that Jet Magna Convoy is one of my favorite combiner Transformers, it is a huge pain in the neck to put together, and when - through some miracle - you are able to form Jet Magna Convoy, you'll find out that a strong breeze can knock him over. It makes Jet Magna Convoy impressive and pretty much a whimp. The question involves the fully combined Jet Magna Convoy: Transformers Armada Jetfire's cockpit was being knocked out of place by Transformers Armada Overload. I have two theories why this may happen. 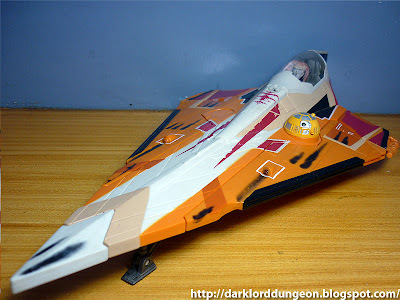 Presenting from Star Wars: Saesee Tiin's Jedi Star Fighter. I found Saesee Tiin's Jedi Star Fighter while trawling the black market. It was complete, loose - with no stickers unfortunately, but the paint job well hid that fact. I purchased Saesee Tiin's Jedi Starfighter for PhP 300 - a big steal considering that if you trawl the market now, despite the influx of this particular Star Fighter, you'd find it selling for around PhP 500 to PhP 600. A lot of people remember Jedi Master Saesee Tiin as either a member of the Jedi Council or one of the Jedi Masters who accompanied Jedi Master Windu when they went to arrest him. Jedi Master Saesee Tiin was cut down there by the emperor - he was the horny guy - the book version of the story gave him a longer fight than the movie did. In the book, Emperor Palpatine tricked Jedi Master Saesee Tiin into trying to use his natural telepathic powers. Palpatine cut him down while he was distracted. A lot of people do not know that Jedi Master Saesee Tiin was a ace pilot and a member of the Jedi Starfighter Corp and one time commander of Red Squadron (Of no relation to Luke Skywalker's Red - and later Rogue - Squadron - just a nice coincidence). G.I. Joe Pursuit of Cobra Skydive is one of the few G.I. Joe POC characters that were released locally c/o Toy Kingdom and sold at a more reasonable rate of PhP 499.75. If he looks familiar, it's because G.I. Joe Pursuit of Cobra Skydive is a repaint/re-issue of a - supposedly - never officially released G.I. 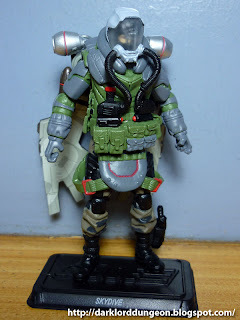 Joe Rise of Cobra Ripcord. We reviewed the G.I. Joe Rise of Cobra Ripcord earlier this year. The review can be seen here. 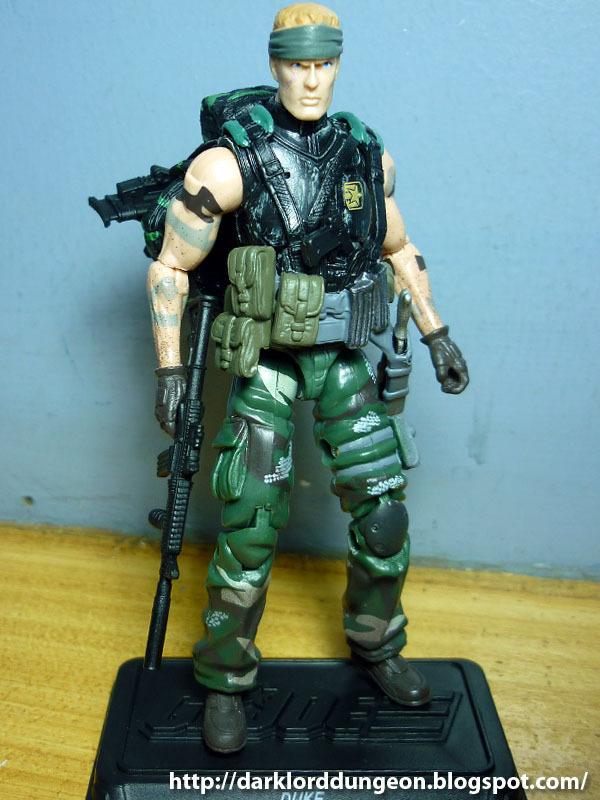 "Batman" commented on that review that Hasbro either was unable to secure the rights of the original G.I. 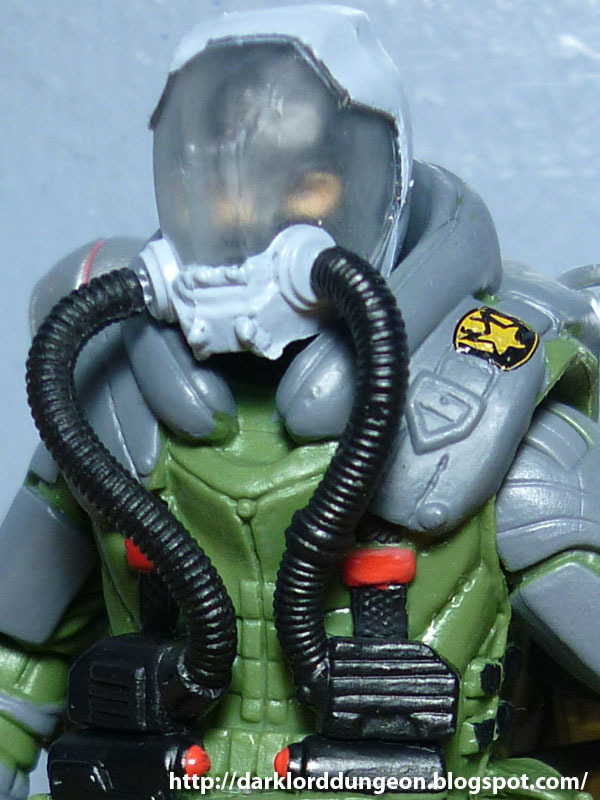 Joe Rise of Cobra actor's facial features or saw them as unprofitable, which resulted in the re-tooling of the figures back to their cartoons/comic-book looks which is why Hasbro did not officially release Ripcord wearing this, but came up with a new G.I. Joe Pursuit of Cobra Skydive instead. Presenting Snake Eyes from G.I. Joe The Pursuit of Cobra Wave 3. AKA Snake Eyes Ninja Commando. 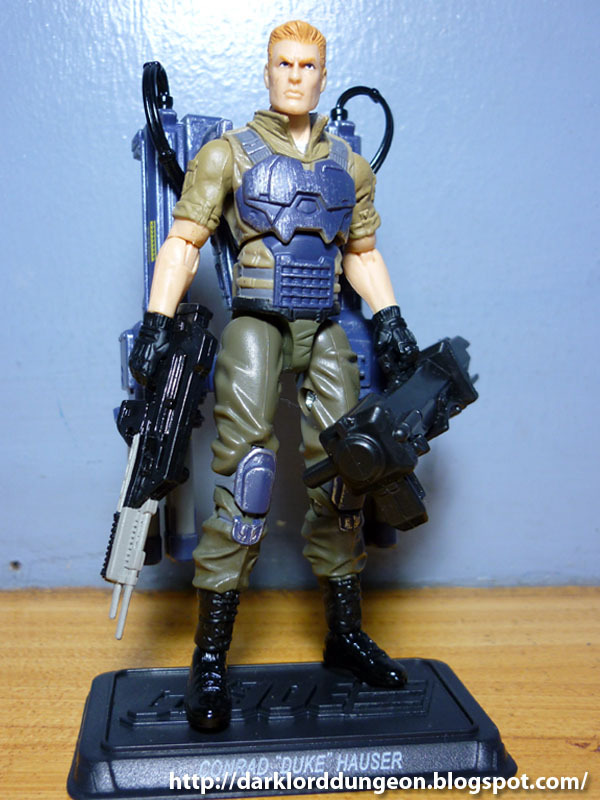 This is probably one of the more reviewed figures in the market, so I'll keep this review short and simple: Yes, Snake Eyes comes with everything you see here in this picture. Yes, it's sheer over-kill - and that's not even everything that he has yet. 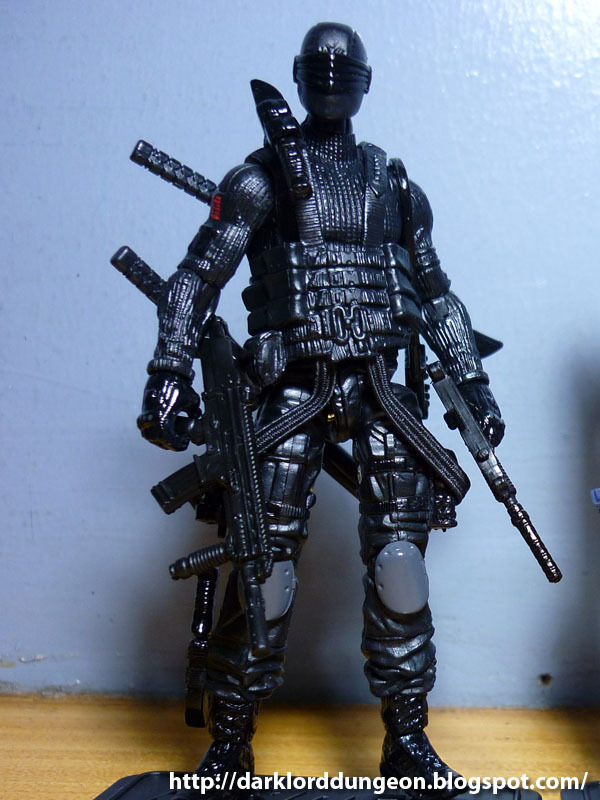 This particular Snake Eyes feels like someone at Hasbro got so sick and tired of all the criticisms and reviews that previous Snake Eyes have received over the years - "Oh he should have this... Oh he should have that... Oh Snake Eyes won't leave home without this...." that the toymakers decided to throw in everything into one toy and let the fans sort it out. The bad news is.... after opening the package.... I had to ask "Where's Timber?" (In the distance I heard a gun go off as a toymaker offed himself cursing my name). One of my favorite websites, the Daily Blam recently published this preview of upcoming Green Lantern toys that will be released along with the movie. Please click on the link provided for the full preview on the Daily Blam website. 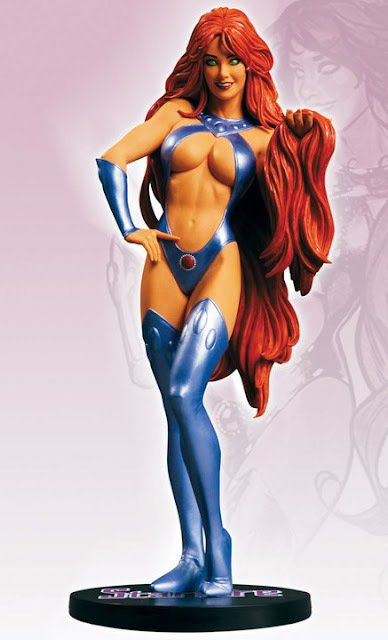 Sadly I'm not really that impressed with the upcoming toy-line - though I hope to be proven wrong. 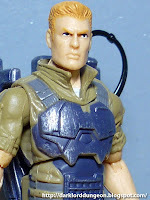 One of the characters in the upcoming Green Lantern Stel. 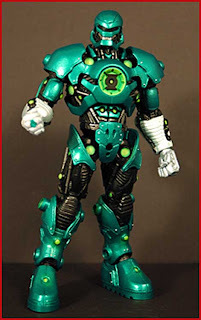 The new Green Lantern series portrays Lantern Stel as a bug-like cybernetic creature versus his more traditional look - which I immensely prefer - that will be released as the action-figure that you collect and assemble in the upcoming DC Universe Green Lantern Series 2. Conrad "Duke" Hauser from the G.I. Joe Pursuit of Cobra Wave 3. What I find strange about this particular figure of Duke is that Hasbro decided to break from the rest of the Pursuit of Cobra line - which started out with a more modern, grittier presentation of the G.I. Joe world and took a step back to present a new Conrad "Duke" Hauser with a look more akin to the G.I. Joe Resolute line - in fact, the paint scheme is almost identical and the only major difference between the G.I. Joe Resolute Duke and this Conrad "Duke" Hauser is the dropping of his flak vest in favor of the more modern body armor. So he's clearly an odd man out. Conrad "Duke" Hauser also differs from the traditional Duke because of the almost invisible scar on his left cheek ruining his American "Captain America" looks. 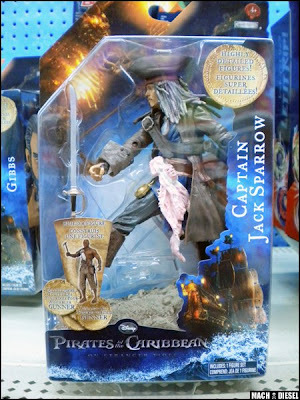 I came across the following Pirates of the Caribbean: On Strange Tides Action Figures that will soon be hitting the market on a friend's Facebook page. 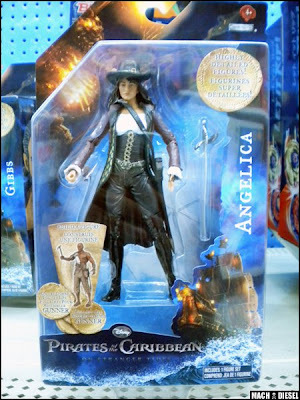 The detail that you can see on Captain Jack Sparrow and the new leading lady - Angelica (Black-Beard's daughter played by Penelope Cruz) - looks simply exquisite. This is a series that I will be looking forward to. The photos were found on SMU Toys - a toy manufacturer, collector and seller. His facebook page is here. Presenting Wreck-Gar Deluxe Class from the Transformers Reveal the Shield line! 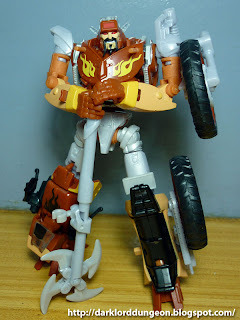 Wreck-Gar is without a doubt one of the best Transformers in my collection - and I hope that you will see why soon enough. Though I have to admit I originally never liked Wreck-Gar, mostly because when the Transformers: The Movie was released in 1986, Wreck-Gar beat the crap out of Springer - who till today is actually my favorite Transformer - and because I found Wreck-Gar's (and the Junkion's) ability to self-repair almost immediately a form of cheating. But Wreck-Gar distinct TV lingo, charm and lines with Kup (Who can forget Bah-weep-Graaaaagnah wheep ni ni bong?) 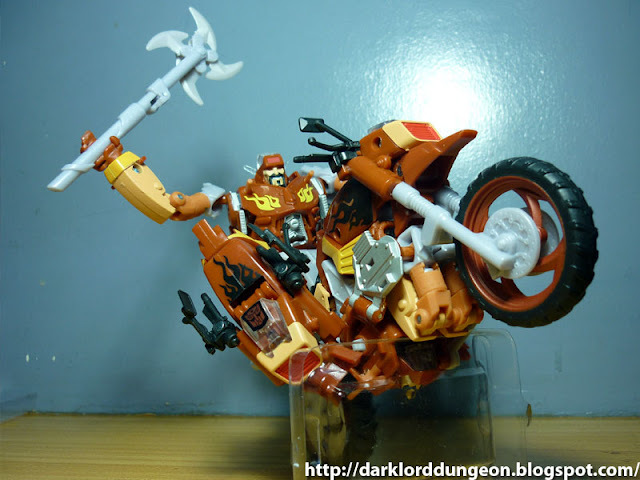 earns Wreck-Gar a permanent place in Transformer lore. Bah-weep-Graaaaagnah wheep ni ni bong? 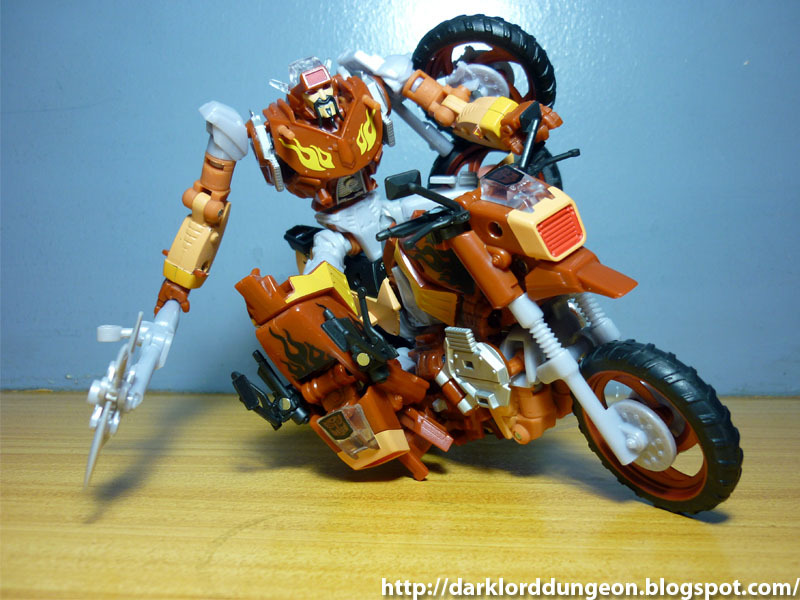 This incarnation of Wreck-Gar tries to remain true to Wreck-Gar's form from the cartoon. While there are obvious differences (His right leg, and rear-tire being the biggest), the tribute to the original is there - especially Wreck-Gar's trademark smirk and goatee. Liberties were of course taken such as giving Wreck-Gar a larger axe, the gold & blue flame stripping on his chest and fuel tank. There's an attempt to transform Wreck-Gar's front-tire into a shield - just like it is in the cartoon, but Wreck-Gar loses the spikes that accompany it in the cartoon. 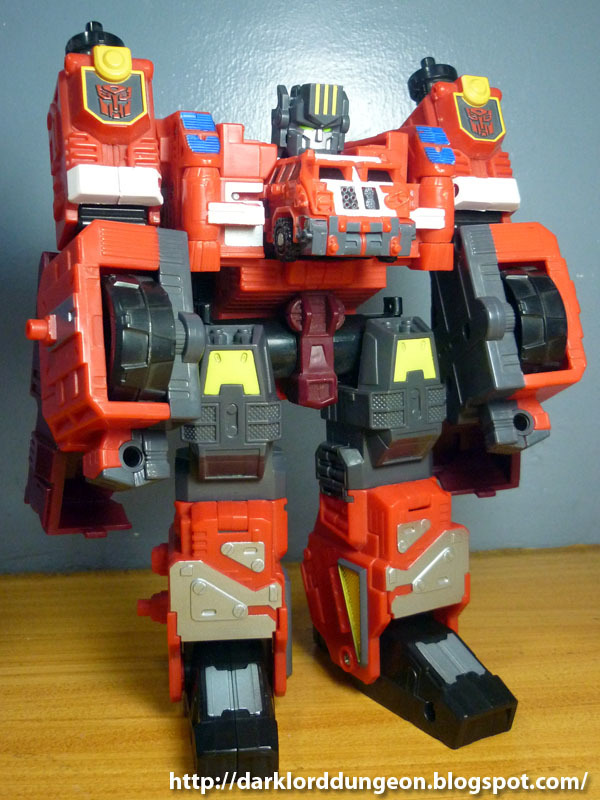 Wreck-Gar is also much slimmer than he appears in the cartoon. 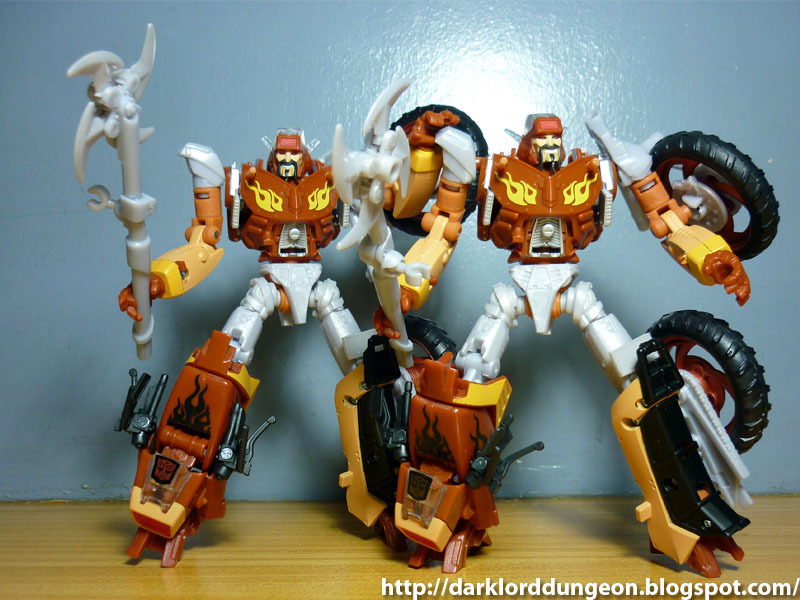 Wreck-Gar's original quote was "Collect and save, Collect and save", but this incarnation of Wreck-Gar bears no such motto. Yes! If you have more than one Wreck-Gar, then you will soon realize that Wreck-Gar was made to ride! 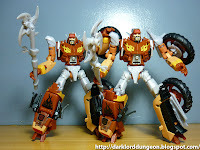 Collect them and you have a Junkion ARMY!!! They're indestructible and they're everywhere! Let me tell you my personal motto: VICTORY IS MINE! 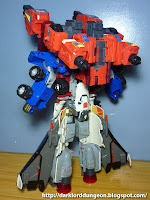 Presenting my Transformers Armada Jetfire - not to be confused with the ancient SR-71 Blackbird with targeting problems from the movie. 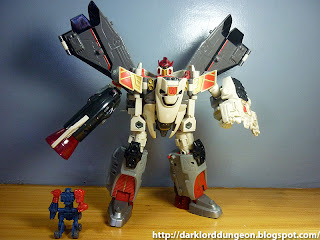 Jetfire is Optimus Prime's second in command throughout the Unicron Trilogy (Armada, Energon & Cybertron) but Jetfire is probably best known for when he combines with Optimus Prime in Armada and Cybertron. I found this particular Jetfire while trawling through the Black Market of Greenhills. I found Jetfire loose, but complete and fully functional so I got him for half the price of what he costs - simply because Jetfire was loose. 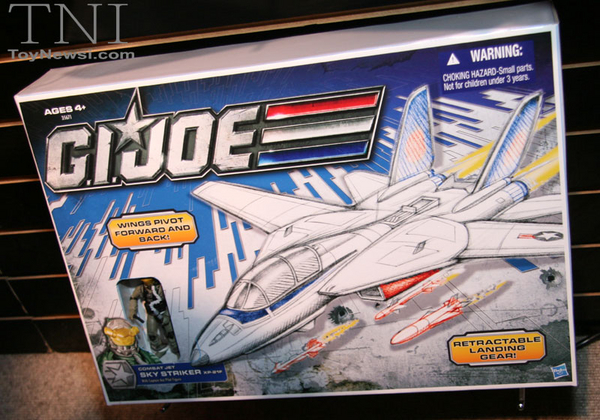 Nowadays a fully boxed version of Jetfire would probably sell for PhP 4,000 to PhP 5,000. 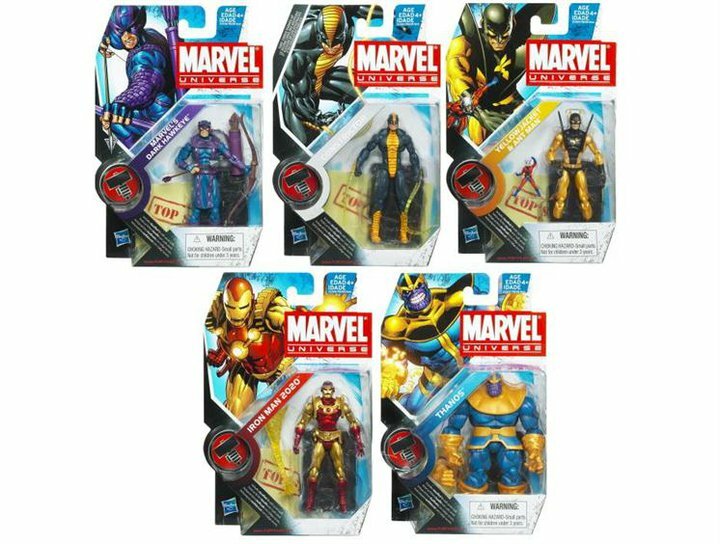 2Rats Toys and Anime Philippines just announced today that they are now carrying Marvel Universe's Wave 11. 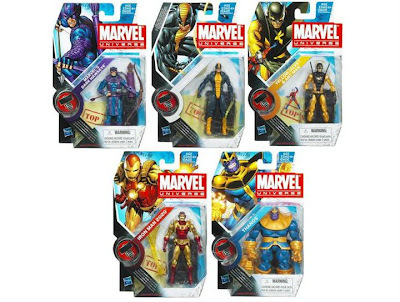 Included in this much sought after wave are the articulated forms of Thanos - yes, the one where you can take his hand off and replace it with a hand wearing the Infinity Gauntlet; Dark Hawkeye (Too bad he's Bullseye again - oh wait, he's dead now); Constrictor (still somewhere out there getting drunk over losing Diamondback because he's insecure about how he rates as a man against Captain America - Steve Rodgers); Yellow Jacket (Who's back to being Giant Man again (Sigh)); and IronMan 2020 (Would have been great if his mask opened up and you can see the "Old" Tony Stark). 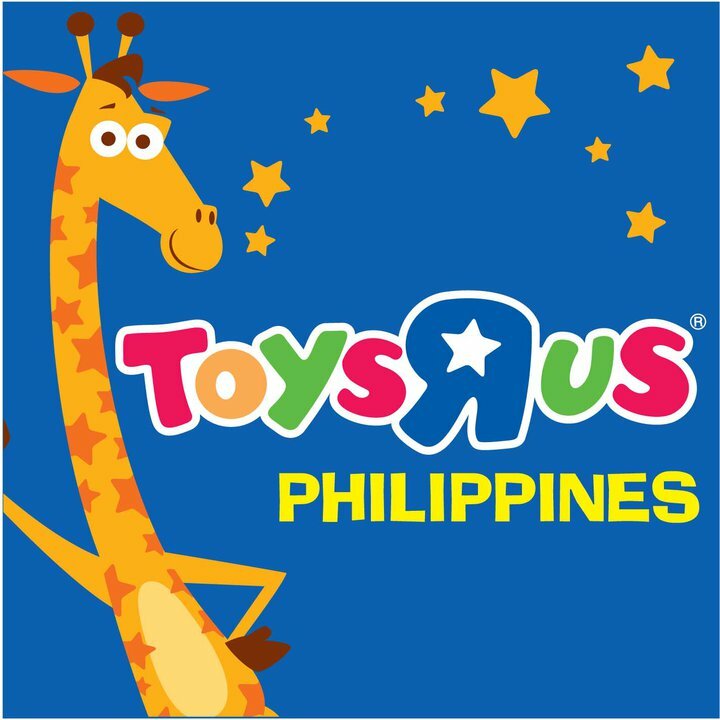 For more information, visit 2Rats Toys and Anime Philippines here. 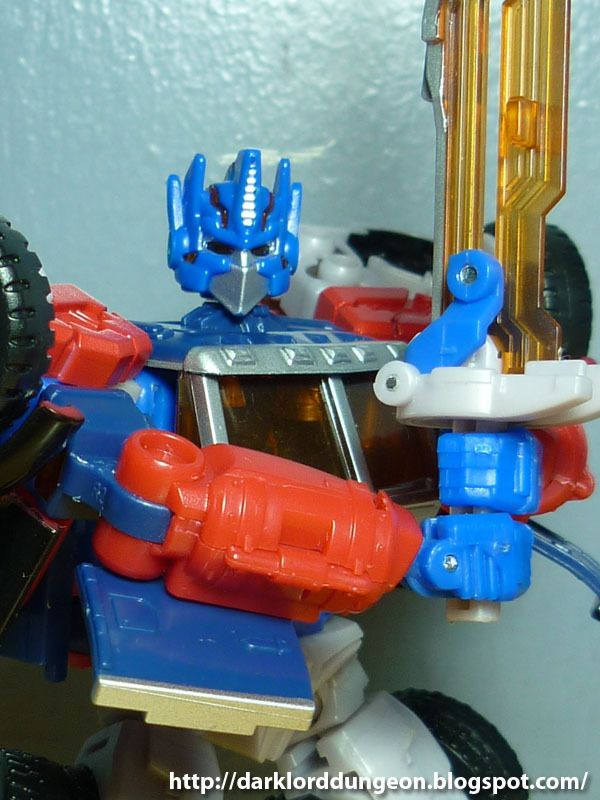 Presenting the Deluxe Class Generation 2 (G2) Laser Optimus Prime from the Transformers: Reveal the Shield line. 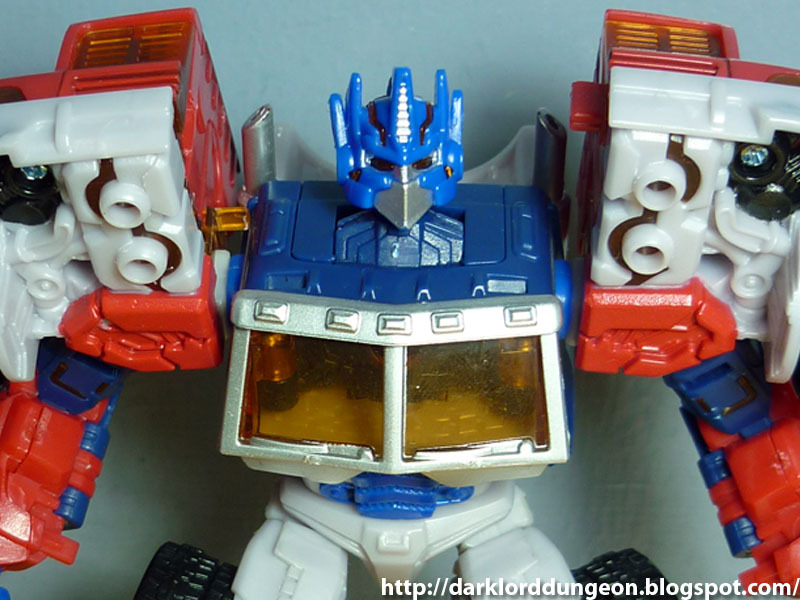 It's a re-make of the G2 Laser Optimus Prime. Just like the original G2 Laser Optimus Prime, the box describes this form as a result of severed damage to Prime's body which called for his having to be rebuilt. The original was called "Laser" because his main weapon was a "Laser-Guided" missile and also because it had a button that lit up a red LED in his hand which - as the properties of light goes - traveled up the sword in his hand so it looked like a Laser Sword. This version however does not have any such diode or lighting, nor does it have a laser-guided missile - but it does have the sword and it does have a plethora of translucent parts. He even has the same more Japanese, anime type facial structure as the original Laser Prime. Unfortunately, I have to say that I have a Brown Beast War Gorilla Prime that carries a surfboard that looks more like an Optimus Prime than this does. 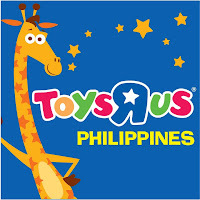 Toys R' Us Philippines will be having a Summer Toy Sale from March 6 to 14 at the Robinson's Midtown Wing Atrium (A.K.A. The new wing of Robinson's Place Manila - you can't miss it) from 10:00 in the morning to 7PM in the evening. A Foldabots three-day workshop will be held at the Lopez Memorial Museum for adults and kids alike by John Jomike Tejido - creator of the Foldabots - for three consecutive Saturday mornings on May 8, 15 & 22, 2011. The objective of the workshop would be to get people to get in touch with their inner child and not just create, but conceptualize, prototype and finalize robot toys. Participants will find their drawing and spatial skills put to the test as they learn about paper engineering, strength of forms, 3D drawing and coloring, character design and even descriptive writing. For more information, click this Lopez Link. John Jomike Tejido's multiply page is here. 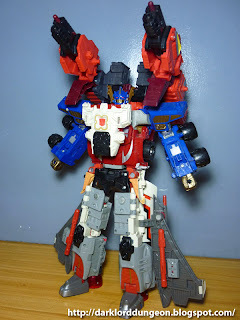 Presenting Transformers Armada Overload! Overload is one of the more interesting characters in the Marvel Universe in the sense that he has no character. He's not sentient. 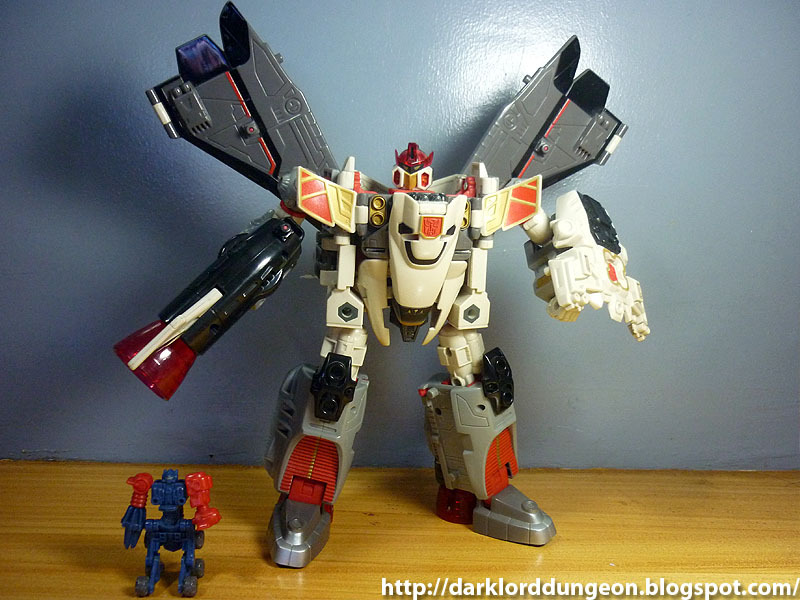 He's a drone much akin to what GodBomber (Apex Bomber) was to Ginrai (Powermaster Optimus Prime - to be reviewed at another date). He's primarily nothing more than a trailer extension for the Transformers Armada Optimus Prime that transforms into shoulder mounted cannons for Optimus Prime. 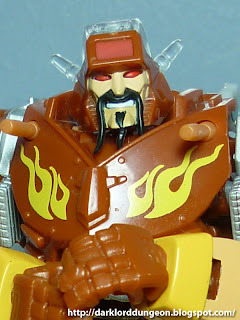 The unclear part is, just like GodBomber, he surprises everyone by transforming into a robot mode as well with the help of Rollout, his mini-con who becomes Overload's head (Effectively also making him a Headmaster) begging the question "Shouldn't the mini-con be sentient and ergo Overload is sentient?". Also in the Transformers Armada cartoon, he is sometimes erroneous referred to by Optimus Prime as Ultra Magnus. As a result, there is actually a very rare blue version of Overload in the market. One I have actually yet to even see in person. While nursing a very bad viral flu over the weekend and into the first two days of the week, I came across some very promising news on the web - there was nothing else I could do but click, so I surfed. I came across the latest Toy Con news from toynewsi.com which showcased what to expect within the year for fellow G.I. Joe collectors. The G.I. Joe highlight for the collection was a spanking brand new SkyStriker!